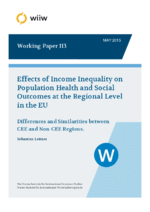 This paper analyses the relationships between various measures of income inequality and variables describing population health and social outcomes at the regional level in the EU. Differences between the Central and East European new EU Member States (NMS) and non-NMS EU countries are highlighted. By applying fixed and random effects and cross-region regressions, we found negative relationships between income inequality and life expectancy, infant mortality, standardised death rates on various causes, rates of violent and property crime, rates of non-activity and early leave from education of young persons. The results indicate that redistributive policies might be an effective measure to reduce social harm and improve population health.